Previous studies of flocks, swarms, and schools suggest that animal societies may verge on a "critical" point—in other words, they are extremely sensitive and can be easily tipped into a new social regime. But exactly how far animal societies sit from the critical point and what controls that distance remain unknown. 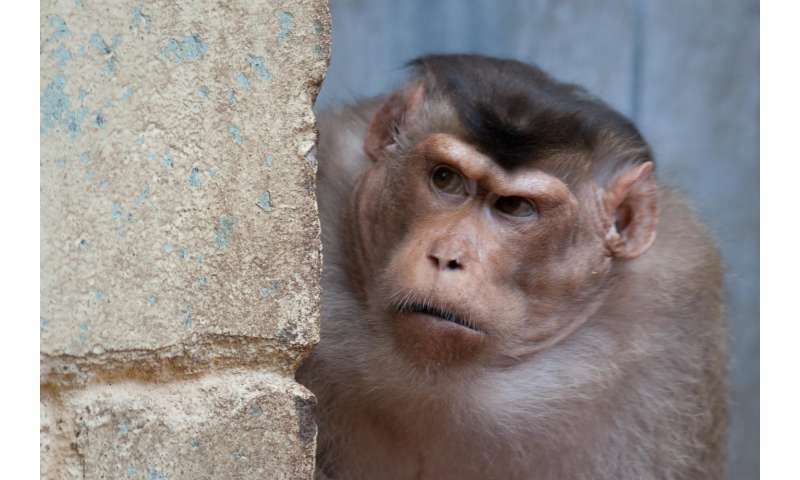 Now an analysis of conflicts within a captive community of pigtail macaque monkeys has helped to answer these questions by showing how agitated monkeys can precipitate critical, large-scale brawls. In the study, fights were often small, involving just two or three monkeys, but sometimes grew to be very large, with as many as 30 of the 48 adults in the society. Bryan Daniels at the ASU-SFI Center for Biosocial Complex Systems, together with David Krakauer and Jessica Flack of the Santa Fe Institute, used ideas and models from statistical mechanics to ask whether the monkeys' conflict behavior was near a critical point. They report what they found in this week's Nature Communications. Daniels, Krakauer, and Flack discovered that the distance from the critical point can be measured in terms of the "number of monkeys" that have to become agitated to push the system over the edge. Daniels says that in this system "agitating four or five individuals at a time can cause the system to destabilize and huge fights to break out." However, Daniels says, each monkey makes a distinct contribution to group sensitivity—and these individual differences may allow distance from the critical point to be more easily controlled. Group members that break up fights can move the system away from the critical point by quelling the monkeys that contribute most to group sensitivity. Other group members, by targeting and agitating these individuals, can move the system towards the critical point and ready it for reconfiguration. Animal societies may benefit from the group sensitivity that lets them cross critical social thresholds. Being sensitive allows for rapid adaptation—think fish switching from foraging mode to escape mode—but it can also make a society less robust to individuals' mistakes. This tradeoff between robustness and adaptability is related to distance from the critical point. An open question is whether animal societies collectively adjust their distance from criticality, becoming less sensitive when the environment is known and more sensitive when the environment becomes less predictable. Daniels says, "I think we've just scratched the surface." This is the situation that lies in the backdrop of what the world is dealing with today. Create, hold and amplify the conditions for war... agitate, cross link, escalate - and so on. Profiting in the genesis, the flow, and the outcomes. It's been their game for thousands of years. A game, at it's core... built out of sociopaths and psychopaths. KBK - I suspect that it is not the clandestine groups that survive on change that they direct, but - rather - those that are favored by the embedded power structure and habitually create alarm to consolidate their dominant position and the status quo. Under certain situations, however, those outside of that embedded structure - normally peaceful and largely passive - become sufficiently agitated that they are driven to bond outside the established power structure, and overthrow it.... Societal evolution. Trump sure can agitate others. When can we expect the Revolution to begin?